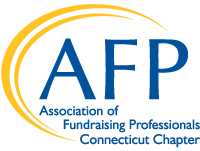 AFP Connecticut provides fundraising professionals across the state with educational, networking and professional advancement opportunities, but as with any organization, our beginnings were humble. AFP Connecticut Chapter was founded in 1979 and led by Joseph Coffey, its first president. Organizational meetings began in 1978 after Joe attended an NSFRE conference in New York City. Joe talked with NSFRE officials about the support provided fund raising professionals through the statewide chapter system. Already impressed with the training and materials he received at that conference, when asked to consider establishing one in Connecticut, he offered to "float the idea" to a few friends in the field. Joe spoke to Warren Dunbar, Executive Director of Combined Health Appeal, and John Seremat from the American Cancer Society, Connecticut chapter. After determining their interest, he went on to set up the first discussion and organizational meeting in Wallingford at the state office of the American Cancer Society. of the Connecticut chapter of American Cancer Society. Succeeding Joe Coffey as president was Louise Shaheen, who served for two terms, then Susan M. Weber, CFRE, who also served for two terms. A complete list of presidents and their terms follows. Bob Doyon and Susan Weber, active chapter members since 1981, have fond memories of early chapter meetings held at the Lord Cromwell Hotel in Cromwell, Conn., where six or seven members would be a good turnout. As the AFP Connecticut Chapter grew over the years, a second chapter was established to serve the membership in Southwest Connecticut. It became the Fairfield County Chapter of AFP in 1994. Once established, the Fairfield County chapter shared responsibilities for and income generated by, the annual Philanthropy Day Conference and Philanthropy Awards Luncheon.